While the Nintendo Switch does not officially support wireless headphones, a post-launch update adds a quite workable workaround to the problem. The 4.0.0 update to the Nintendo Switch adds big features like the ability to capture video for select games, but it's a small, unannounced feature that may prove to be the most important. The support for audio over USB added in the patch allows certain wireless headsets to connect to the Nintendo Switch. 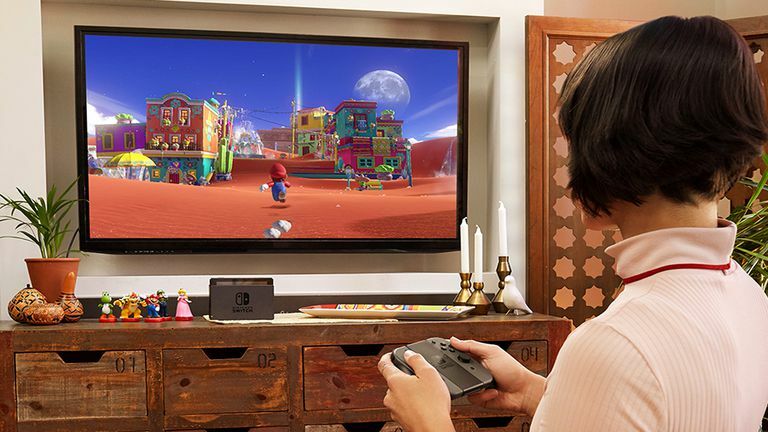 The Nintendo Switch uses Bluetooth to communicate with the wireless controllers, and like other gaming consoles, it doesn't allow Bluetooth headphones to connect directly to the system. The workaround provided in the 4.0.0 patch allows wireless headsets that use a USB dongle to provide the wireless capability. The Switch will not work with all Bluetooth headsets, so you should consult the verified list (see below) before buying a headset. Because this is not an officially supported feature, it's possible a future update removes the ability to listen to audio over Bluetooth, although this is unlikely. The instructions for connecting a wireless headset to the Nintendo Switch vary based on whether you are using the Switch while docked or using it unplugged from the docking station. Plug the USB dongle into one of the USB ports on the side of the dock. It really is that simple. The Nintendo Switch should recognize the device and you will see a prompt on the upper-left corner of the screen showing a USB volume control. But what about when the Switch isn't docked? The Switch itself only has a single USB port, and it is a USB-C port at the bottom of the device. If you want to go completely wireless, you will need a USB-to-USB-C connector. Plug the USB-to-USB-C connector into the USB-C port on the bottom of the Nintendo Switch. Plug the USB dongle for your wireless headset into the connector. As you can clearly see, connecting the headset while not docked is twice as complicated. On a serious note, it may take a few seconds for audio to transmit whether docked or not docked. The key requirement is to use a Bluetooth headset that comes with a USB dongle designed to be plugged into a compute or gaming console. Unfortunately, not all wireless headsets that meet this requirement actually work. LucidSound LS30, LucidSound LS40. These headsets require an optical cable to be plugged into the dongle. SteelSeries Arctis 7. This headset needs a 3.5mm 3-pole cable that is not included with the headset. Pay close attention to both the name and model number when buying the headset. For example, while many Turtle Beach Stealth models work with the switch, the 420X does not. What If Your Headset Isn't Working? If you have problems with audio, the first thing you should do is consult the list above and ensure that your headset is listed. Unfortunately, not all wireless headsets will work with the Nintendo Switch, however, future updates may enable more headsets to properly operate. First, ensure the headset is properly charged. If you have another device that works with the headset such as a compute or another gaming system, hook it up to that system. This verifies the headset is in working condition. If you are using it in undocked mode, try using it with the Nintendo Switch docked. If this works, you may have a problem with the USB-to-USB-C connector. Last, if you have the Switch docked and the headset USB dongle inserted into one of the USB ports on the side, try switching ports. Not only are there two ports on the side, there is one hidden in back. To access this one, open the lid on the back of the dock. This is the area with the power and HDMI cables. Between these two ports is a third USB port.